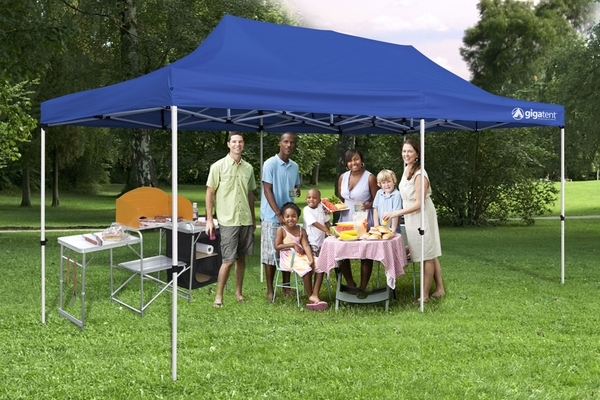 Pack Size: 60" x 17"
Plan your picnic without worrying about the weather. 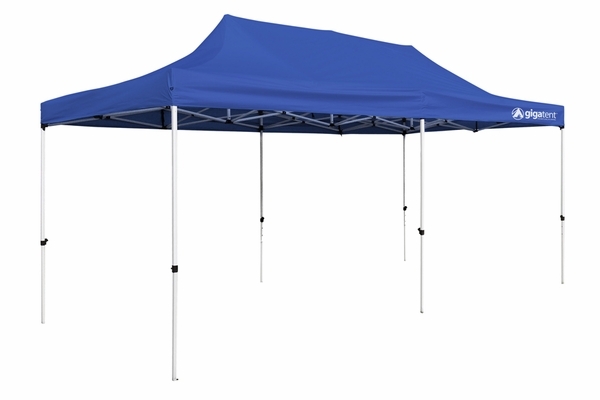 This 10 x 20 canopy from GigaTent provides plenty of shade and protection for 200 square feet of ground. With its powder-coated steel frame, it's durable and stable enough that you won't have to worry about a warm summer breeze blowing it away. For days when it's a bit more gusty, we're even packing in extra stakes and lines. GigaTent even made it so that it's easy for just two people to set this party tent up in under three minutes. 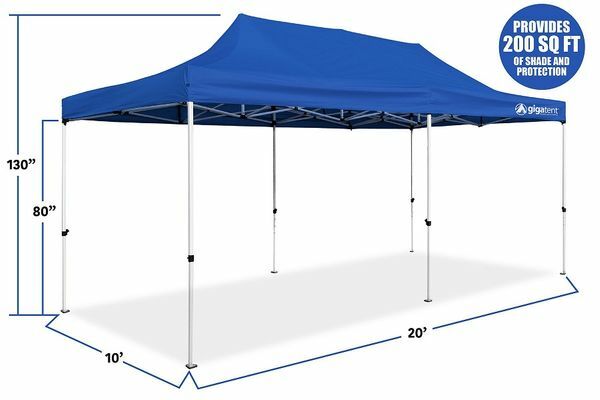 Will the material of this GigaTent 10x20 outdoor canopy allow custom graphics to be printed on it? Yes, but we are unable to print on this unit. Most companies have to print on the material before the tent is sewn together. We can do custom graphics on Caravan, Vitabri, KD Kanopy, Ohenry, Eureka and Celina brand items. You can fill out the form at the following link and upload your logo for a free quote: Canopy Custom Graphics Quote Form Our Graphics Department must actually see your logo as well as the placements you require the logo before they can provide you with a quote. This is the second time I have purchased this outdoor canopy, and I'm not sure the manufacture, but the quality of the canopy is very good. I am looking to purchase canopies or tents for our preparedness response. The shelters would need to be high enough to allow a vehicle to pass under. If the canopy was used width wise instead of length wise, what would be the max. height from ground to bottom of the valance? 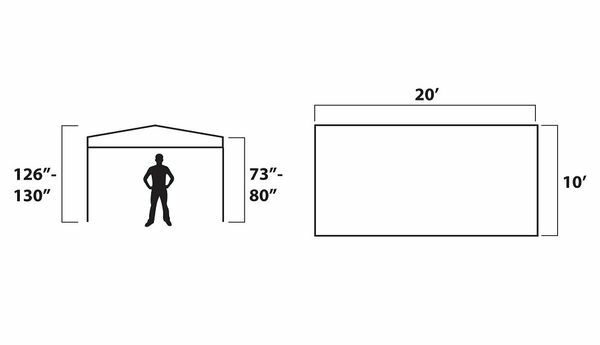 The maximum height from the ground to the bottom of the valance for this canopy would be 80 inches at its highest setting. Are these tents water proof, or water resistant? These are not totally water proof but are very water resistant. The only 10 x 20 canopy we have that is totally water proof is the Vitabri. Can you get side walls for this canopy? Giga Tent stated they have side walls as accessories. We also have them in solid blue or solid white. Are there any wall accessories for this 10 x 20 unit? Not for this particular model. We do have other 10 x 20 canopies that sidewalls are available for, however. One option is the Undercover 10 x 20 Commercial Aluminum Popup Shade Canopy Package with White Top. A pair of sidewall sets, the Undercover 10 Foot Zippered Poly Sidewall - Set of Four would need to be used to enclose this model. Are there side panels for this tent? Not for this particular model. 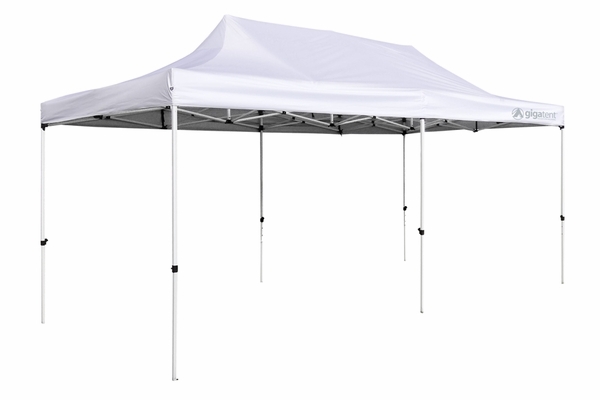 We do have other 10 x 20 canopies that sidewalls are available for however. One option is the Undercover 10 x 20 Commercial Aluminum Popup Shade Canopy Package with White Top. A pair of sidewall sets, the Undercover 10 Foot Zippered Poly Sidewall - Set of Four would need to be used to enclose this model. Easy set up. I had put this up in our back yard for a party 4 weeks ago. We thought we'd leave it up for the weekend and it's been up since . water repellent through a few rain storms, we know we have to take down soon but we are enjoying it. we love the shade and you can see the silver coating form the inside that is the sun protection .... worth the money ... shipped very fast arrived double boxed . Prosworth the money ... shipped very fast arrived double boxed . This canopy is not as good as the one we ordered 1-2 years ago. A piece has broken off and one of the legs broke off. We were using it for a school car race and then for a school yard sale. Will not be able to use it for another event. ConsNot as expected. Not durable. Love the canopy. Fairly easy to set up and our customers refer to it as our event mini mall. It is big, stands out, and draws the crowd. I would recommend to a friend. Tent was very easy to set up, looks very nice and was easy to take down. The only bad part of tent was that it leaks some at the seams. I cannot believe how fast and easy this was to set up. The fabric is strong and thick, the poles are sturdy. It went into the bag with ease. It comes with a sturdy bag that has wheels. I love it, can't wait to go camping and use it. Hanging lanterns will be so easy. Great value for the money.